Florida is #1 in the nation for bicycle and pedestrian crashes and fatalities, and within the state Collier County is among the top 15 most dangerous places to walk or ride a bike. Floridians have an active outdoor lifestyle, so be prepared to Share the Road with bicyclists and pedestrians. Bicycles have a legal right to ride on the street as well as on most sidewalks. Provide at least three feet of space between your vehicle and the bicyclists when passing. Look for bicyclists and pedestrians before making a turn. Do not block crosswalks or bike/pedestrian crossings when you stop at an intersection or when you are pulling onto the street. Yield to bicyclists and pedestrians at crosswalks and when they are crossing at unmarked intersections. Look both ways for bicyclists and pedestrians before exiting a parking space or driveway. Only honk your horn in emergencies. There are a lot of cars in Southwest Florida, so be prepared to Share the road courteously with motorists. Obey all traffic laws, including stopping at STOP signs or red lights. Ride in the same direction as other traffic – on the road and on the sidewalk. Stay alert – don’t wear headphones and sty off of electronic devices. BE PREDICTABLE! Don’t swerve in and out of traffic, and use hand signals. Do not ride more than two abreast. As a courtesy, allow motorists to pass when they are lined up behind you. Be visible - wear bright colors and make sure your bike has front and rear lights. If you are riding on the sidewalk, watch for cars in driveways, and be prepared to stop. It’s wonderful to be outside in Florida, and when you are on the street or sidewalk remember that you have to obey the same “rules of the road” as motorists and bicyclists. BE VISIBLE. Wear light colored clothes at night, walk in well-lit areas, and make sure motorists/bicyclists see you before you enter the roadway. Stay off electronic devices, especially when crossing. Obey traffic signals and signs. Follow the traffic laws. Only cross at crosswalks or intersections. Don’t jaywalk. Do not assume vehicles will give you the right of way. Walk on the sidewalk whenever possible. When sidewalks are not available and you must use the road, walk against traffic. NPC Safety Tip Cards are printed with information for motorists on one side and bicyclists on the other. They are currently distributed throughout Collier County through the Department of Motor Vehicles and local businesses, and in Bonita Springs in Lee County. Over 100,000 cards have been distributed in the last two years. Your business or organization logo can be imprinted on the card for a minimal fee. 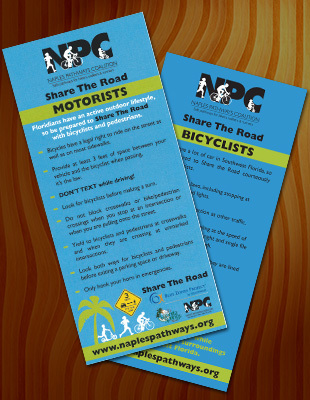 For more information about obtaining Safety Tip Cards, please contact Naples Pathways Coalition.